YOU are so much MORE than you think you are. You are Smarter, Stronger, More Capable, More Creative, More Passionate and More Powerful than you can even imagine, and I want to PROVE it to you!” What is the Craziest, Most Unrealistic, Preposterous, Outrageous, Impossible Dream you could EVER IMAGINE manifesting in your life? Williamsburg Regional Library, 515 Scotland St.
"JUMP! The Workshop. 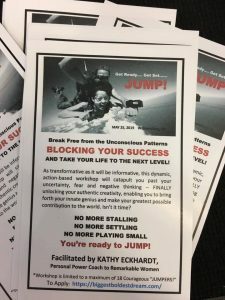 The Deep Dive into your own GREATNESS will be happening in the heart of Colonial Williamsburg, VA on May 25 from 9:30 - 4:30. There will be a 1 1/2 hour break for lunch on your own surrounded by all the ambiance of the Colonial Capital. Many fun places to eat are within a couple of blocks. This transformative workshop could be exactly the class you have been waiting for. And the people in it are exactly the courageous, committed, success-oriented kind of people you want to surround yourself with.